- A recent press release from Dr. Mark. Pet owners must act quickly if their animal is bitten by a snake this summer to boost its chances of survival, a veterinarian says. Dr Mark Perissinotto, head vet at online pet supply retailer VetShopAustralia, said the sooner the animal is taken to a vet the greater the chance of keeping your pet alive with fewer post treatment complications. “The warmer weather unfortunately brings with it the danger of snakes, and they are out in force this summer,” Dr Perissinotto said. “More than 6,000 animals are bitten by snakes in Australia each year and around 80 per cent of pets survive snakebites if treated quickly. Dr Perissinotto said if a vet was some distance away, pet owners could apply first aid by applying a firm bandage over and around the bite site to help slow the venom spreading to the heart. Dogs and cats are most often bitten around the head and limbs. Dr Perissinotto said in a worst case scenario, dogs that are bitten multiple times can begin vomiting in 5-30 minutes, be paralysed in 2-4 hours and can die 2-5 hours after being bitten. Possible signs of a snake bite including shaking or shivering, lethargy, excessive drooling, dilated pupils, vomiting and diarrhoea. Dr Perissinotto said antivenin, together with intravenous fluids, is the prime treatment for snake bites in pets and can cost around $1,000 to administer. 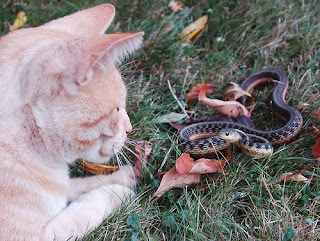 “Pet owners can try to prevent snake bites in the first place by tidying up backyards, which includes removing rubbish and wood-heaps, and avoid walking pets in areas that snakes might inhabit such as through long grass,” he said. Brown snakes are the most common cause of snake bites and snake bite deaths in both animals and humans, followed by tiger snakes and black snakes.